Mo has given us the word TREE for Manic Monday. Although it was raining an icy rain, Vinny and I went out this morning to help Rose put the lights on her Christmas tree. Her tree had been delivered and placed in the stand a couple of days ago by the delivery man. 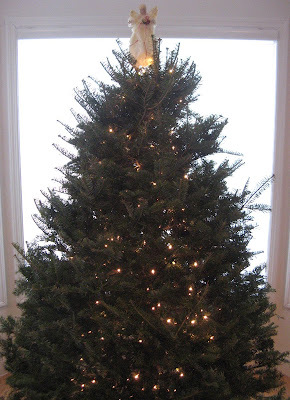 It was ready to be decorated but first the lights had to be strung. We spent a couple of hours stringing the lights and did a pretty good job, I think. We strung the lights from the top down which seems to be a no-no in all the instructions you find on the Internet. Ha! Here's Rose's tree with the lights and an angel topper. Now she has to put on the ornaments. Go visit all the other Manic Monday participants here. Tree lights are always a problem, it seems. I string them from the top down as well. Thats funny, my husband use to go round and round and then up and down. But we're weird anyway. looking at the tree with lights and the angles it strikes me; trees are really at their prettiest just so, lights and nothing more. whish you a happy Christmas. I shall celebrate today and do some late night packing afterward. No time for playing this Tuesday, alas. God bless you and overwhelm you and your dear ones with love, peace and harmony. Very nice tree with lots of potential to be fabulous with the ornaments on it. Woofenderful tree. Check out my post fur good decorations to put on yur tree. Instructions? Haha. I string mine from the top first as well. Pretty tree. How nice to have it delivered and set up for you. I've always done lights from the top down! That's how I learned it. You mean all this time that has been wrong??? Stringing lights is so tedious. We bought a pre-lit tree a few years ago, but now the lights are all burned out!